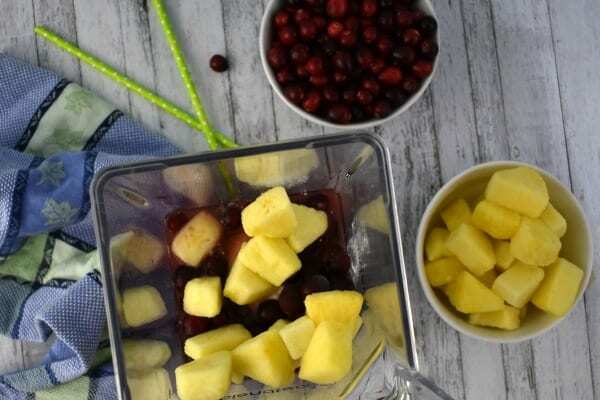 Try a Pineapple Cranberry Smoothie for an irresistible flavor combination that’s unexpectedly perfect any time of year. Add mini Pineapple Cranberry Smoothies to your brunch table in small glasses and watch your guests fall in love! There are some recipes I like a lot, and there are others that I just love. 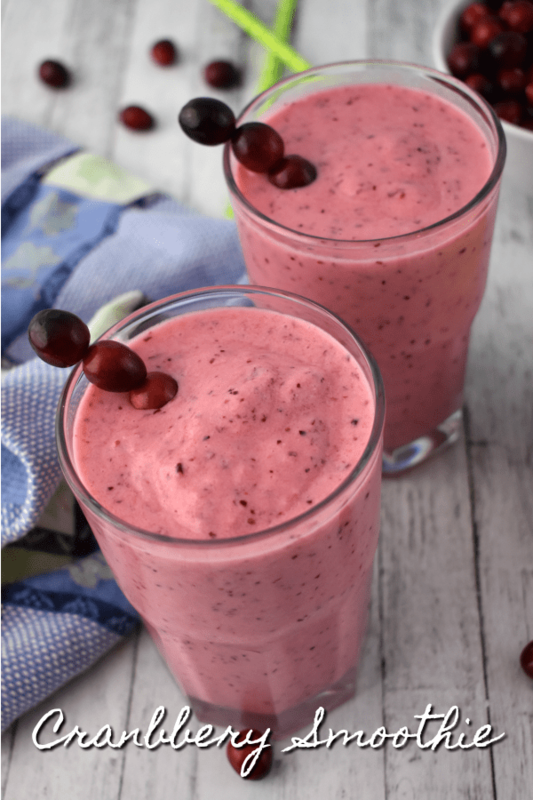 I am over-the-moon in love with my Pineapple Cranberry Smoothie! It’s got a sweet and tart flavor that’s perfect for waking you up in the morning, but there’s just the right amount of creaminess from the yogurt. While you might think of cranberries only during the holidays, this is a smoothie and tasty and nutritional all year long! 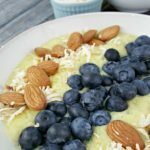 This smoothie is the perfect opportunity for you to sneak some healthy goodness into your family. 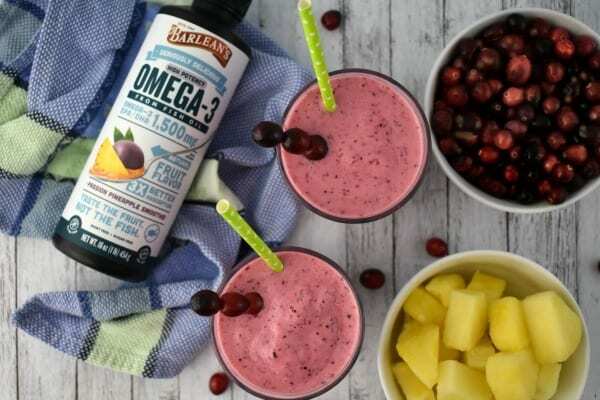 Not only are cranberries one of the healthiest fruits you can eat, but adding Barlean’s Omega 3 Swirl gives the Cranberry Smoothie a boost of amazing nutritional benefits. 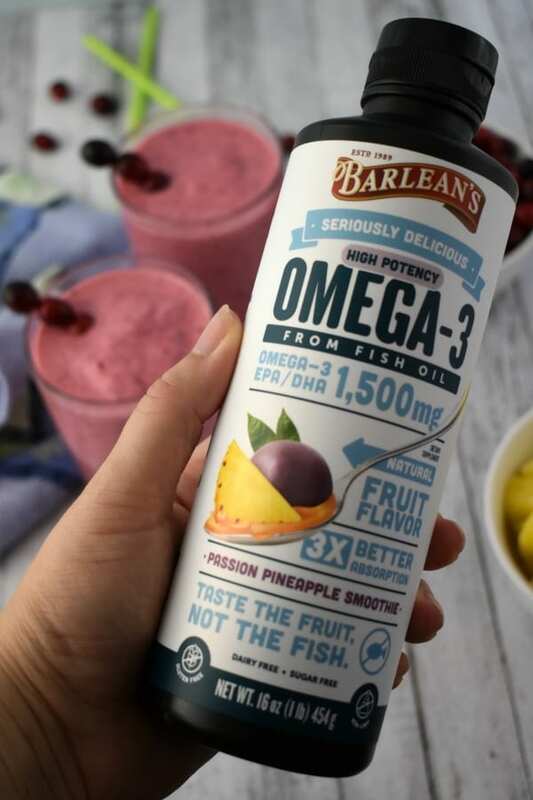 Because of the way Barlean’s makes their Seriously Delicious Omega-3 products, your body can absorb 3x more Omega-3s than if you take traditional liquid fish oil or softgels. Plus, it tastes waaaay better! 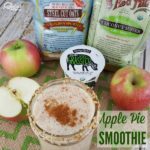 I use Barlean’s Seriously Delicious Omega Swirls in just about all my smoothies for the added nutrition and health benefits. There are tons of great flavors, including Strawberry Banana Smoothie, Pina Colada, Mango Peach, Pomegranate Blueberry, Lemon Creme, Orange Creme, Key Lime Pie, Blackberry Smoothie, and Citrus Sorbet. Cranberries are considered a superfood because the contain antioxidants that fight disease. With vitamins B, C, E, fiber and more, cranberries are one of the world’s healthiest foods! In addition, studies of have shown that cranberries are good for the brain and can improve your memory, help heal skin conditions, and flush your kidneys. Fresh cranberries are healthiest. If you’re using frozen or dried cranberries, be sure to check the label for added sugar. Like cranberries, pineapple also contains vitamins B6 and C and loads of antioxidants. The enzymes in pineapple can even help ease digestion and can even ease the symptoms of arthritis. 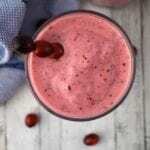 Packed with nutrition from the pineapple and cranberries, this is an antioxidant-rich smoothie with an Omega-3 boost. Into the blender, add the juice, yogurt and Barlean's Passion Pineapple Seriously DeliciousOmega Swirl. Add the elderberry syrup if desired. Pulse to combine. Add the pineapple and cranberries and pulse 3-4 times until the mixture begins to puree. Taste for sweetness and add honey (or other sweetener) as needed. Puree until smooth and creamy. If the mixture is too thick, add a splash more juice until the smoothie is your desired consistency. If you are using fresh fruit, but want a frozen smoothie, add 1 up of ice to the blender with the fruit. 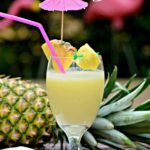 Switch up your juices for various flavors by using pineapple juice, or try orange juice, which pairs well with cranberries and pineapple. Add other fruit such as strawberries or pomegranate seeds for even more antioxidants! Use less liquid and more yogurt to create a beautiful Pineapple Cranberry Smoothie bowl instead. Top with fresh fruit, nuts, and seeds. 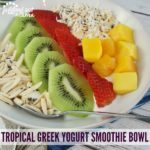 Big Flavors from a Tiny Kitchen makes a beautiful and tasty Tropical Superfruit Smoothie Bowl. Our Blueberry Cranberry Granola Bars Recipe make a great snack anytime of day! I would have never thought of the combo of pineapple and cranberry! Sounds Delish. I’ve always wanted to try the flavored Omegas! I’ve never had them before. This looks awesome! What a unique flavor combination! It seems like it wouldn’t work, but it’s totally amazing!